I usually get a little (sometimes, a lot) blue about once a month. I also get headaches and migraines around the same time and see the negative in just about everything. This may well be hormonal or just my personality – I am not of a sunny disposition at the best of times (so unlike my daughter who is a regular Pollyanna – not sure how that happened). My husband half jokes that underneath all the surface gloom I am actually a positive, happy person but afraid to declare it to the universe for fear of reversal. He’s not entirely wrong. When I am feeling down I seriously crave chocolate (ok the hormones also play a part here) and the diet can take short vacation for these easy chocolate soufflés. They are worth every sinful spoonful and they can be made last minute to round off a beautiful meal. They also just happen to be gluten-free as well. I have baked them into quite sizeable mini-pie dishes but you could make 4 smaller ones if you so wished. These are perfect for Valentines Day – you can impress with minimum effort! The soufflés will puff up impressively in the oven (note to self: don’t overfill) and then collapse slightly as they cool. It all adds to the gooey deliciousness! I am also spreading the chocolate love around a little – one lucky reader will win a beautiful selection of Lindt chocolates from their Valentine’s Day collection. Scroll down to the bottom of the page for details on how to enter! 1. Preheat the oven to 170C | 340F. 2. Place the chopped chocolate in a bowl and set over a saucepan of barely simmering water, making sure the bottom of the bowl doesn’t touch the water. Let the chocolate gradually melt and stir it together until smooth. 3. Put 100g (3.5oz) of the melted chocolate into a bowl and reserve the rest to drizzle at the end. Add the melted butter and gently mix together with a whisk. 4. Whisk the egg whites in your stand mixer until they form soft peaks. Transfer to another bowl. 5. Whisk the egg yolks, vanilla and sugar until white and fluffy. Feel a bit of the mixture between your fingers – it should not feel gritty. If it does, continue whisking for a bit longer. 6. Gradually add the chocolate mixture into the egg yolks and whisk it in. 7. Add a dollop of the egg whites and mix in using a hand whisk to loosen. Fold or gently mix in the rest of the egg whites and divide between two 13cm/5in shallow mini pie dishes or ramekins (or four smaller ones). Only fill about 3/4 of the way – the batter will rise in the oven. 8. Place the soufflés on a heavy tray and bake for 20-25 minutes until the soufflés are risen and feel mostly firm with a bit of a wobble in the centre. 9. 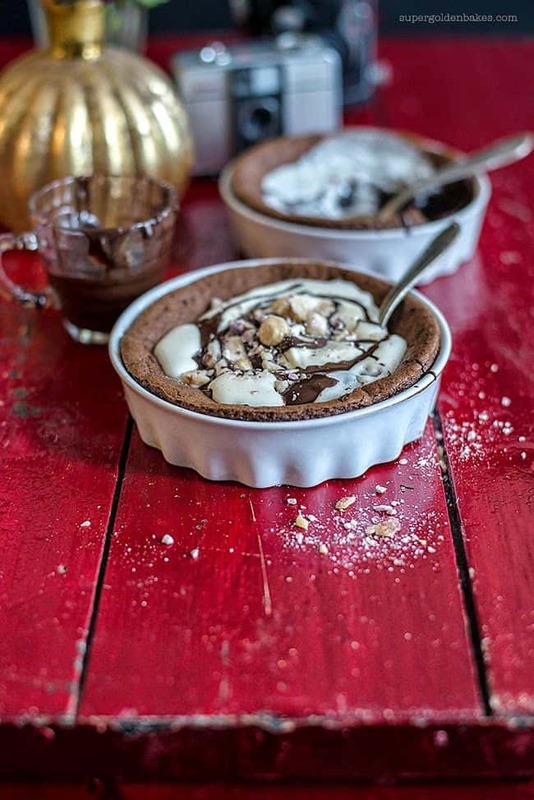 Add a dollop of whipped cream to the still-warm soufflés (it will slowly melt down) and drizzle with the reserved melted chocolate. Sprinkle a handful of chopped hazelnuts if you like and serve immediately. > Giveaway open to UK residents over the age of 18 only. The giveaway ends on the 14th of February. > Please comment on this blogpost before proceeding with other entry options. > The winner will be randomly selected, announced in the Gleam giveaway box and contacted via their provided e-mail address shortly afterwards. Please claim your prize within 4 days of being notified.